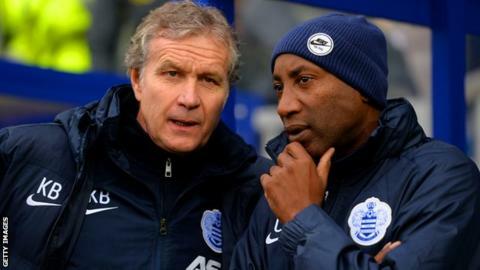 QPR caretaker manager Chris Ramsey says he would be delighted if he was offered the job on a full-time basis. The club have made contact with Tim Sherwood as they look to replace Harry Redknapp, who resigned last week, and have placed Ramsey in temporary charge. "If you got offered the chance to coach a Premier League team you would jump at the chance," said Ramsey. "But, more importantly for me, is that QPR avoid relegation regardless of whether I am here or anybody else." QPR lost 1-0 to Southampton in Ramsey's first game in caretaker charge and his second game will be at Sunderland on Tuesday. Asked if he thought Sherwood would be appointed, Ramsey said: "I know that director of football Les Ferdinand, chairman Tony Fernandes and the owners will go through a process of elimination with other candidates. "I'm sure the fans would want to see a transparent procedure that allows us to bring the best person in." QPR centre-back Rio Ferdinand has not played since a 3-0 FA Cup defeat at home to Sheffield United on 3 January but is set to start at Sunderland on Tuesday. Bobby Zamora is also likely to figure at the Stadium of Light as fellow striker Charie Austin is out injured. Centre-back Richard Dunne and full-back Nedum Onuoha are also both out. "Rio was always in my plans for Tuesday's game. We spoke about it last week and he understands," said Ramsey. "I said it last week, anyone who is fit and available and showing the right attitude and desire in training will be in contention. "Rio's trained hard and applies himself superbly. He'll start at Sunderland, as will Bobby." QPR have lost all 11 away games so far in the Premier League this season. "I think there's a little bit of psychology when we're away, but the players are determined to turn the away form around," added Ramsey.